The Pioneer Valley Workers Center called for a National Day of Action this week to demonstrate a broad base of support for immigrant rights leader Eduardo Samaniego. Eduardo has been in Immigration and Customs Enforcement (ICE) custody since the middle of October 2018 and was placed in solitary confinement for eighteen days following a hearing in which he was denied bond in December. Out of fervent hope for Eduardo to return home to Western Massachusetts -- and grave concern for Eduardo’s health and wellbeing -- communities across the country petitioned ICE for Eduardo’s immediate release. 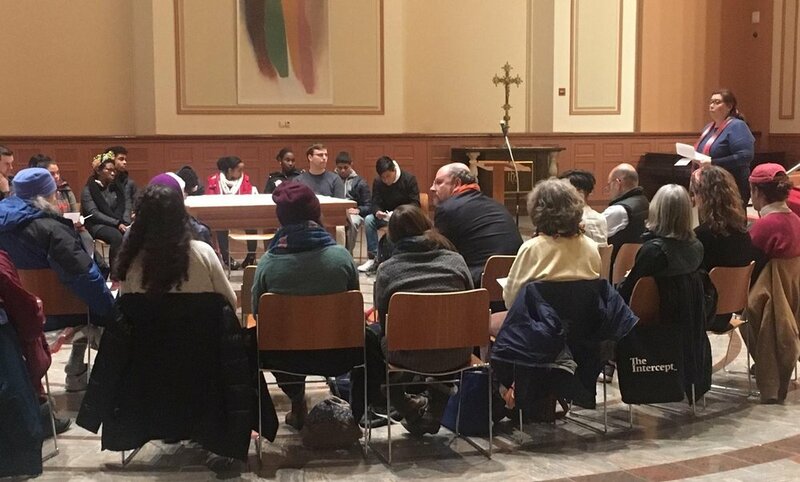 On Wednesday evening, Episcopal City Mission partnered with local organizers and personal friends of Eduardo to host an interfaith vigil at the Cathedral of St. Paul in downtown Boston. Over 30 people gathered to pray and sing together, to light candles and commit to continued action until Eduardo is free. Bar Kolodny, a youth organizer at St. Stephen’s Youth Programs and college classmate of Eduardo’s, read a letter written by Eduardo from detention. Zayda Ortiz of Indivisible shared stories of organizing with Eduardo on the Safe Communities Act. We closed with a song of freedom and courage, expressing to Eduardo: “you will not walk alone”. As a result of the continued pressure on ICE and the power of vigils from LA to Atlanta to Boston, Eduardo was granted a continuance until Friday, Jan 25th. We will continue to fight for his release to Massachusetts.